Thank you all for your tremendous support around my pregnancy! The first trimester has been much more difficult than I expected. I was out of the office for two weeks due to nausea & extreme fatigue. You all have been so supportive as I have needed to cancel and reschedule appointments. Thank you. I am glad to say that I am back in the office this week, but it is in a very limited capacity. I am seeing 1-2 clients a day between the hours of 1 & 5p. I will be maintaining these hours at least through the end of my first trimester, September 16th. If you currently I have an appointment scheduled outside those hours, I will be contacting you to reschedule. I am also in the processing of rescheduling all of you that I had to cancel during my two-week absence. I appreciate your flexibility and understanding and I look forward to seeing you soon. At some point in the growth of every private practice, one must decide whether to grow, to shrink or to sustain. Over the past eight and a half years, I have had the privilege of saying “yes” to almost every opportunity and client that has come my way. And as a result my bounty abounds. At this point I have a full load of clients. 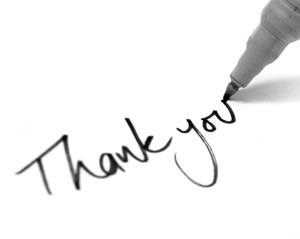 In order to best serve you all, my existing clients, I have made the hard to decision to say “thank you, but no.” I am intentionally stopping the growth of my practice, so I can focus on those I currently and historically have worked with. This will ensure that you can find a place in my schedule; that when you need me I will be accessible. As of today I will not be accepting new clients. I will review this decision in the fall to make sure that it is still the best choice for all. You all have been so good to me by building my business through word-of-mouth. You appreciate the work I do and you send me your friends and family. Fear not, Karen Waters, that amazing massage therapist that I have been telling you about, is ready and excited to work with the friends that you would normally send to me. I have had the pleasure of experiencing Karen’s work personally and I cannot say enough good things about it. Her touch is sensitive. She knows when to go deeper or stay light. She is thorough. She completely attend to your tissue; working through all the layers that need attention. So I ask you to pass the bounty you have shared with me to Karen. You can reach Karen at 802-497-7632. I usually don’t make a big deal out of Father’s Day. 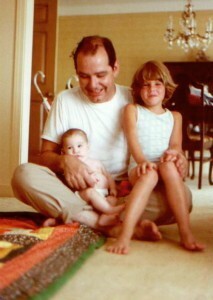 In fact, I am notorious for forgetting to call my dad on Father’s Day. Well this year is different. It’s official! My husband, Eben, & I are officially in the “pool” to adopt an infant. Eben & I have completed the application and home study process, which determines that we are viable candidates to be adoptive parents. 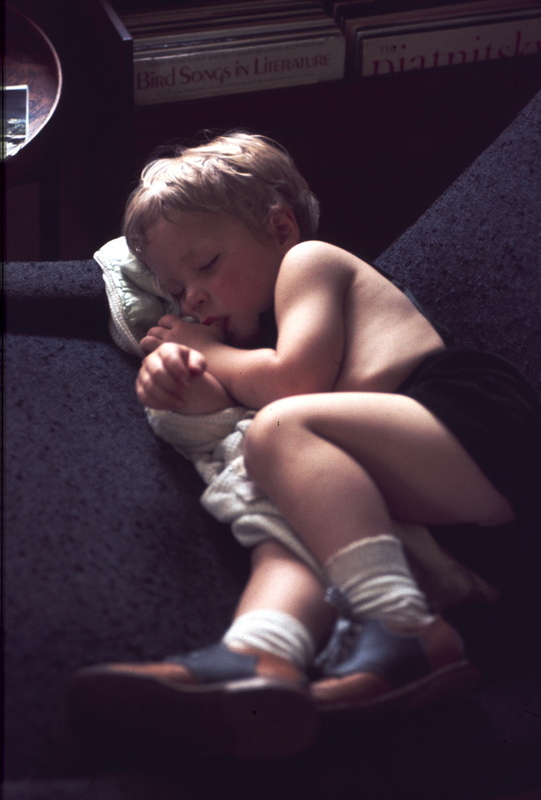 This process also helps us to determine our comfort zones and boundaries around adoption. We have filled out a “preference sheet” with specifics such as gender, ethnicity, birth parent medical history, birth mother exposure to nicotine, alcohol & drugs and contact with birth parents post adoption. Knowing what we are comfortable with is very important to this process. We are now waiting. Waiting to have our preference sheet matched with a birth mother’s preference sheet. Then the birth mother is given photo books (our life in pictures) for all the couples that fit. And she selects the couple she wants as adoptive parents. What does this mean for you? Good question…I will continue to see clients up until we have the baby. This will happen sometime in the next 1-2 years. Before the baby arrives, I will get about 1-2 months advance notice that we have been matched with a birth mother. As soon as I know this I will let you know. I will be taking approximately 6 months off for maternity leave. (Yes, I do realize that with a child in the picture plans have a way of changing.) 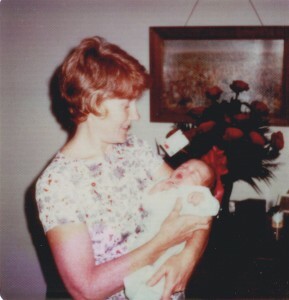 Karen Waters (the awesome massage therapist now working at Stillpoint with me) will be available to see you while I am on maternity leave. When I come back from leave, it will not be full-time right away. I will need to wait and see, to decide what will work best for all of us. In the meantime, please know that I am committed to continuing my work with you. While you will not be able to watch my belly grow, I am sure you will hear the excitement grow in my voice. Thank you for your support and flexibility in this new adventure! It gives me great pleasure to introduce to you Karen Waters. Karen moved her practice to the Winooski Stillpoint office on May 1st. She has been here a month now and I could not be more thrilled. Karen is massage therapist specializing in Trigger Point Therapy. Trigger Point Therapy focuses on releasing the small contraction “knots” (called trigger points) which develop in muscle tissue when it is injured or overworked. The most common causes of trigger points are repetitive motion, trauma or tension caused by stress. These small “knots” tighten the muscle, which decreases blood flow, pulls on tendons and causes local or referred pain. Ultimately mobility is decreased and nerves can become impinged causing numbness and tingling. 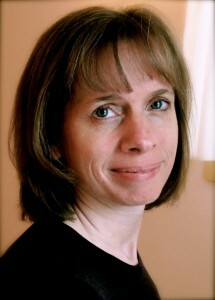 Karen started her practice in 2000 as a general massage therapist. In 2004, the nucleus of her life switched to raising a family. When she came back to her massage practice in 2007, she decided to focus specifically on Trigger Point Therapy. Karen is also a practicing nursing in Cardiothoracic & Vascular Surgery at Fletcher Allen Health Care for the last twenty years. I have had the absolute pleasure of receiving Karen’s work and she is good! I do not say that lightly. As you know I am very particular in the bodywork I receive and Karen exceeded my expectations. Please join me in welcoming Karen to Stillpoint. 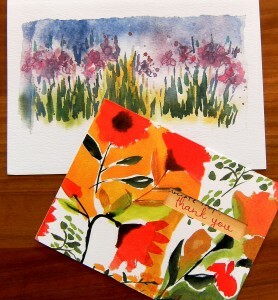 Over the last month I have received several wonderful cards of thanks both from clients and friends. 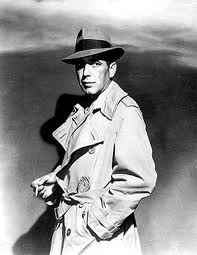 However, I have not been doing anything different or out of the ordinary. So why the sudden change? We live in a society where it is often easier to say “thank you” to a stranger who holds open the door for us, than to deeply and specifically thank a friend or loved one. Is that because we do not appreciate those that are close to us? I think not. Quite the opposite seems to be true. Our friends and family are constantly doing things to support us. We love them. We cherish them. Maybe we even take them for granted. But do we remember to thank them? Now it is my turn to thank you. Each of you came to me looking for something: increased balance, less pain, greater ease of movement or simply to feel better. You gave me your trust. You trusted me to care for you in the best manner I knew. During this time, you opened up to me. You shared your concerns and fears as well as your joys. You chose to make your health a priority in your life. And you chose me to help you with your health. You have given me a life that I love. Before I met you, I never realized how fulfilling and invigorating work could be. Occasionally I may come to work a little tired, but I always leave energized. You challenge me to be the best bodywork practitioner I am able to be. And for all of this, I thank you. How do we see fascia now? Some exciting new discoveries about fascia have been made in the recent years. Thanks to the bodyworker and anatomist Tom Myers, we are starting to study anatomy in relation to the continuous web of fascia that suspends it. Through dissection, Myers has show that there are “lines” both structural (existing in the tissue) and functional (involved with movement) throughout the whole body. 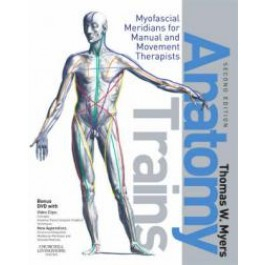 Myers’ book, Anatomy Trains, delves into this different way of studying anatomy. This is an important shift in understanding because previously, the human body was viewed as a series of systems (respiratory, digestive, musculoskeletal, etc.) instead of collectively as a whole structure. Thanks to Robert Schleip’s work at the University of Ulm, Germany, research now suggests that fascia has the ability to actively contract. Historically fascia has been viewed as passive relative to movement. In other words, the movement seen in fascia was only in direct result to the movement of the structures it surrounds. Schleip’s research shows that fascia contains cells that contract and relax in response to mechanical pressure or distortion. 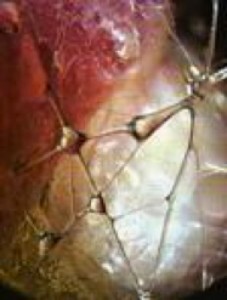 Helene Langevin, a research professor of neurology from University of Vermont, hypothesizes that “connective tissue functions as a body-wide mechanosensitive signaling network.” Langevin’s hypothesis explores three types of signals that may be communicated by fascia. In the end she posits that our understanding of medicine and treatment can change as we begin to see connective tissue as a “bridge” between pathologies in the body. Does the patient, suffering from a flare up of ulcerative colitis preceded by a two-week exacerbation of arthritis of the knee, have two distinct problems or one manifesting in two different ways? 2007 saw the First International Fascia Research Congress where scientists and clinicians meet for the first time to build bridges between what was being felt in the clinic and what was being seen in the lab. This initial congress has resulted in the means of researching touch therapies changing. Unlike being able to take a placebo for a medication, there is no placebo for massage, acupuncture, etc. Thus the paradigm of how to approach research around these fields must change. The Third International Fascia Research Congress will be held in Vancouver, B.C. in 2012. The ability of fascia to glide and thus let you move is dependent on the amount of water in its ground substance. Dehydration can decrease that amount of water—drink more water. Fascial restrictions occur when movement decreases—move more (and if you can’t move have a bodyworker help to move your tissue). Fascia responds to pressure. Think about all the pressure in your gluts, tendons, ligaments of the pelvis and hip joint capsules that is created when you sit at your desk. That pressure is causing your fascia to reshape to this position—move more. Fascia research continues to evolve. For years, the hands of bodyworkers have understood many of the things research is now showing for—get more bodywork. Both your fascia and I thank you for taking the time to better understand how your body works and how you can keep moving for years to come. The answer in one word is tensegrity. The term tensegrity was first used by architect and inventor Buckminister Fuller from the phrase “tension integrity” to describe a principle for designing lightweight integrated structures that deliver great stability with minimal material. Without knowing it, Fuller was describing many naturally occurring structures, not the least of which is the human body. It is a common misperception that our bones hold us up. There is no way scientifically speaking that bones could hold the body up without a tensegrity structure. The tensegrity model posits that a single force in one part of the body will have an effect throughout the body. In the body, fascia serves to maintain appropriate special relationships between anatomical elements. This no better demonstrated than in looking at a tent. Remember last time you went camping and you put up a tent. You started with all the structures (ropes, straps, poles and the fabric of the tent itself). Individually, they were all laying flat on the ground. Then you began to create some tension and compression (tensegrity) as you slide the poles into the sleeves of the tent. And voilà! You have a structure up from the ground. 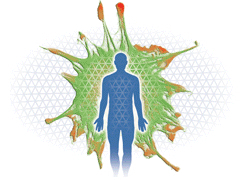 Two key elements to fascial health are hydration and movement. We have already talked about the role water plays in fascial glide. 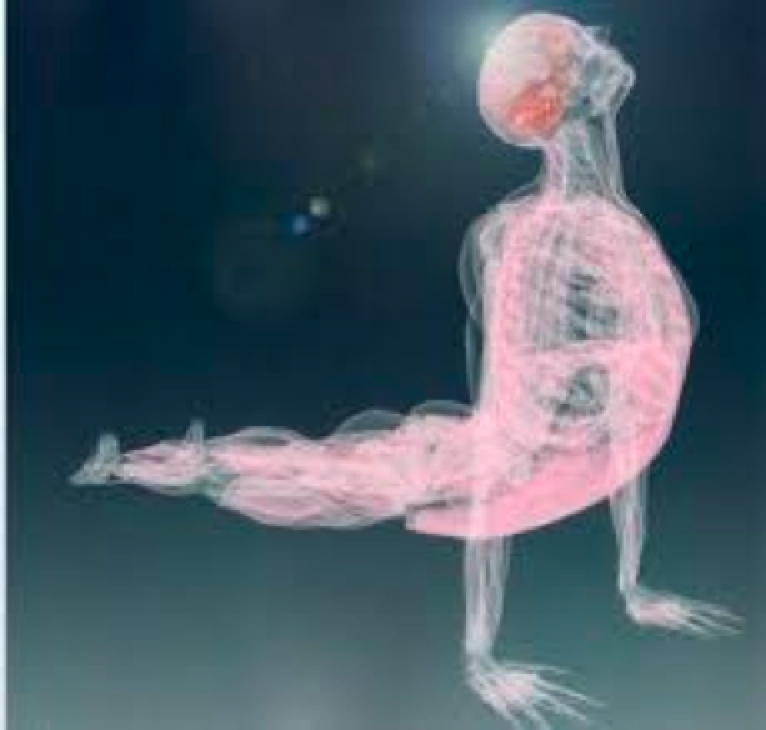 So what role does movement have in fascia health? Here is the A&P: Muscles are designed to contract and relax. Fascia is designed to create structure. Now say you are busy sitting at your desk all day looking at the computer. Over the course of the day, you start to slouch as your erector spinea (the back muscles that hold up you spine become fatigued). Your head moves closer to the monitor as your eyes get tired. Soon the muscles designed to lift your shoulder blades when you shrug are holding up you head. Those levator scapulae are not designed to hold up your twelve-pound bowling ball of a head. If you only did this once—no big deal. But who sits at a computer only once. The problem is when you go back the next day and the next and your body falls into a forward head posture. Your poor little levator scapulae can’t keep holding up your head. So collagen steps in to help. The body is constantly laying down new collagen fibers—which add stiffness to our structure. This thickening of fascia naturally reinforces whatever daily patterns of use that you are engaged in. Movement is critical in making sure that muscles can continue to contract and relax instead of becoming thickened with additional fascia. The following video does a great job showing you this exact process. Gil Headley, anatomist, shows you the collagen fibers (what he calls “the fuzz”) on actual cadavers and demonstrates how it affects motion. Now that you have watched Gil’s video, GET UP AND STRETCH! The last post on fascia will be here soon. Make the most with your movement between now and then. Many of you have heard me talk about fascia: what it is, why it is important and how it affects our ability to move. As I sat down to write a series of articles on the structure and function of the body, I realized that I needed to go back to the beginning. And the beginning is fascia. Fascia has been described in many ways: the “glue” that holds us together, “plastic wrap”, “a spider’s web”. Those words provoke images that just begin to give us an idea of what fascia is. Fascia is so critical is providing structure that it not only surrounds every muscle but also every muscle cell and muscle fascicle (group of muscle cells). 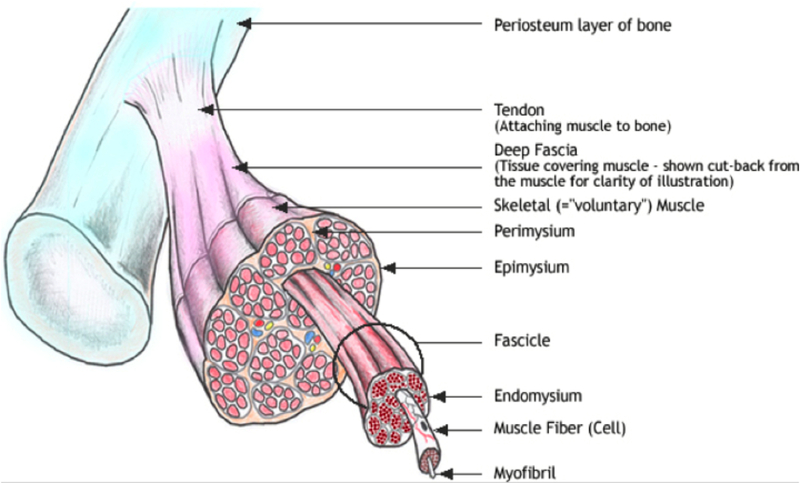 The fibers of fascia are continuous from around the muscle to the tendon to the periosteum of the bone. The name, density and molecular structure of fascia changes based on the anatomical location in the body. In other words, when the “highway” of fascia leaves one structure for a new one (muscle, tendon, bone) the name changes. Just as the road you are driving home from work on is the same road but the name of the road changes when you drive into a new town. As fascia moves to surround this new structure it is also tasked with new job. The fascia that surrounds a layer of subcutaneous fat is much less dense than the fascia that surrounds a muscle. Muscles contract and relax while fat simply pads; thus the fascia around muscles needs to be stiffer and denser. Fascia is made up two fibers: collagen and elastin. The big difference between collagen and elastin is stiffness. Both fibers stretch, but elastin will stretch farther before breaking than collagen. Just as we saw that fascia in adipose (fat) was less dense is also does not have to be as stiff. Therefore is has a higher percentage of elastin than does fascia in muscles. The collagen and elastin of fascia exist on a substrate called ground substance. Ground substance is ”snot” like material. It is the fluid medium of fascia. The most prevalent component of ground substance is water. Water is what allows the fascia to slide across other fascia. Thus, the less water there is in the ground substance; the stickier fascia becomes. Stay tuned for more with “Fascial Tensegrity and Movement”. Stayed tuned for regular blog updates and learn more about how to keep yourself healthy and in balance.